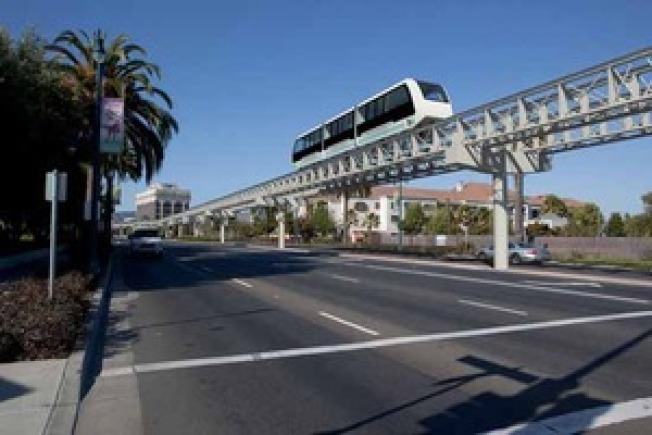 BART's proposed 3.2-mile elevated tramway between the Oakland Coliseum station and the Oakland airport moved closer to becoming a reality this week when the California Transportation Commission voted unanimously to approve $20 million in state funding for the project. The sum represents only a small part of the project's estimated $484 million in total costs, but BART officials said the money is significant because it helps complete the funding for the project. BART spokesman Linton Johnson said the transportation commission's affirmative vote at today's meeting in Fresno was expected because the state agency had previously approved the funding two other times. He said the commission voted on the project a third time because opponents had raised procedural concerns. The Metropolitan Transportation Commission also approved the $20 million in a 6-2 vote two weeks ago. Johnson said work on the connector could begin in six months and will take about 3.5 or four years to complete. The connector, which was first proposed more than 20 years ago, was approved by the MTC and other agencies in 2009, and work was set to begin early this year. But the Federal Transit Administration created a major roadblock in February by denying BART $70 million in federal stimulus money to help fund the project after three advocate groups filed a complaint alleging that BART failed to evaluate whether the project would provide low-income and minority communities with a fair share of the project's benefits. In addition to the $20 million approved by the state, BART is filling the $70 million funding gap with loans and money from one of its reserve funds. Opponents of the project say BART could save hundreds of millions of dollars by developing a rapid bus service between the Coliseum station and Oakland International Airport that would cost between $83 million and $125 million.